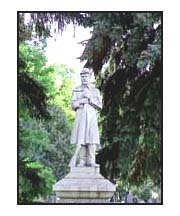 The need for a burial site in Fort Collins arose in 1864 during the establishment of the Fort Collins Military Post by Lt. Col. William O. Collins. The burial ground was located on high ground about one half-mile southwest of the post (present day location of the old Post Office at Oak Street and College Avenue). During the military occupation of Fort Collins through 1867, less than a dozen soldiers appear to have ended their days. According to Ansel Watrous in the History of Larimer County that was published in 1911, six to 10 unidentified remains were found. One burial did contain a small bottle with a note written about the deceased. The remains were those of W. W. Westfall of Company J, 13th Missouri Volunteer Cavalry who died on November 3, 1865. The Post Cemetery was abandoned in 1873 and during that year, ground (presently the area around Eastdale Drive) southeast of the town was purchased and laid out with burial lots. The new cemetery was named Mountain Home. Westfall's remains, those of the other unknown soldiers, and some burials of early settlers were moved to the new site. As the population grew rapidly in the mid-1880's, it was decided to move the cemetery again in order to keep it in a rural setting. This site was used in the early 1920's, after the removal of remains, as a playground for the citizens of south Fort Collins. Land one-mile-and-a-half west of the city was purchased in 1887 from Thomas Connolly for $50 per acre. Grandview cemetery (originally written as Grand View) was located in an area having abundant water rights from the Pleasant Valley and Lake Canals. A 40-acre tract was immediately laid out by landscape gardeners for cemetery purposes. The first interment was a three-month-old baby named Felix Scoville who was buried on November 21, 1887 in Section K. Shortly after this interment, work began to remove the remains from Mountain Home Cemetery to Grandview. According to the FORT COLLINS EXPRESS, "Joe Woodcock acted as grave digger and sexton." No record remains of the number of burials that were transferred. However, it has been estimated that the removal work took a great deal of time. W. W. Westfall was among the remains moved for the second time. His grave now lies on the front edge of the Soldier's Section that has been marked by a simple headstone. The grounds at Grandview were originally laid out in attractive circular drives. Included were several small parks boasting lush bluegrass, well-trimmed shrubs, and beautiful flowers. A one-half acre plat (Section S) was set aside and dedicated to the uses of George H. Thomas/Post No. 7/Grand Army of the Republic, which also included the remains of soldiers buried at the Post Cemetery. Since 1887, many members of Post No. 7 as well as veterans of the Spanish-American War, both World Wars, and the Korean War have been laid to rest in this area. Standing in the center of this section is a life-size figure of a Union Civil War soldier at parade rest. Including a six-foot base, the 12-foot Soldier's Monument stands facing east as a tribute of patriotism from members of the Women's Relief Corp. of the George H. Thomas Post No. 7. The granite memorial was erected in 1905 at a cost of about $1,250. The Soldier's Monument was "protected" by four towering silver spruce trees for many years until one had to be removed due to damage in a windstorm. The Granddaughters of the American Revolution donated two Civil War cannons; both dated in the 1860's, for placement in front of the memorial. Vandals destroyed one of the cannons in 1972. The other was donated to the Fort Collins Museum in 1986. Across the road to the east is a Fireman's Statue that was dedicated to the Volunteer Fire Department in 1909. Grandview remained outside city limits for many years. Only in 1907 did citizens object to its location when a proposed purchase of land on the south side of West Mountain was set for use as a city park. Their concern was to buffer the cemetery from areas with recreational uses. Hence, a row of streets was removed from the original park proposal. The severe influenza epidemic of 1918 reduced the number of available lots, so additional lots were opened in the Grandview Addition, a 10-acre section south of the original cemetery that had opened in 1915. In 1924, a concrete bridge was placed over the canal at Grandview. Rustic sidewalls and flower receptacles were installed on the bridge to give the cemetery entrance a pleasing look that still remains. In addition, countless trees and shrubs have been planted over the years making Grandview one of the most beautiful cemeteries in the area. 1994 welcomed the Armed Forces Flag Display and the following year saw the opening of the Four Seasons Columbarium. Additions to the Four Seasons area will continue in the future. Today Grandview consists of approximately 45 developed acres, 34,000 grave spaces, 70 crypts, 336 niches, and over 22,000 burials. Roselawn Cemetery, located on East Mulberry, was established by a private association in 1947 to accommodate additional burial space and provide a garden-type cemetery. The City of Fort Collins took over the operation of Roselawn in 1959. To alleviate a high water table in the area, the facility was equipped with an underground tile drain system and has not experienced high water levels in over 40 years. Roselawn provides nearly 30 acres of beautiful trees and shrubs, manicured lawns, and a magnificent view of the foothills. Over 2000 burials have been performed at the cemetery. In addition many improvements have been made to enhance the landscape and entrance to the facility. 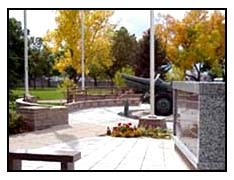 In 1998 an Armed Forces Flag Display and Columbariums were constructed and can be seen at the north end of the cemetery through the tree lined center drive. 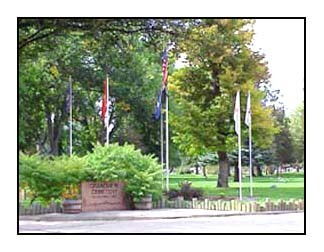 Grandview Cemetery and Roselawn Cemetery are operated by the City of Fort Collins Parks and Cemeteries Division. Call the Cemetery Office at 970-221-6810 for additional information.